Available is this vintage1918 catalog of Post Office Equipment from the McLane Manufacturing Co., Milford, N.H. / Chicago, Ill. 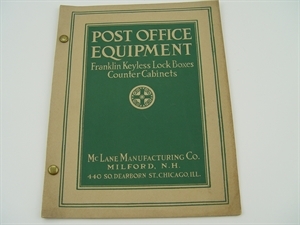 This catalog has 28 pages of lock boxes and counter cabinets and other post office equipment. It has great pictures of each item. This booklet style catalog is held together by brass prongs and is in very good condition.